Aashwas | Asthma Treatment by renowned pulmonologists. A well Planned Asthma Treatment needs routinely tracking symptoms and measuring how well your lungs are functioning. Create a detailed plan with your pulmonologist will help your Asthma Treatment to work effectively. Asthma symptoms can occur reguraly or infrequently and can range from mild to severe. It is extremely important to seek medical attention for this illness. It is the most common chronic illness among children and if left untreated or under-treated, asthma may result in a significant reduction in quality of life, with potential loss of lung function, exercise limitation, difficulty sleeping, school or work absenteeism, costly emergency room visits and in a few cases, death. There is no cure for asthma but it is possible to control the symptoms by properly diagnosed and treated with medications. A very important part of asthma treatment is to properly identify the “Triggers” and avoid them. That can reduce the symptoms and permanent effects of asthma if not eliminated. At Aashwas Chest & Allergy Clinic we have very experienced pulmonologists and allergist who can properly diagnose and create an Asthma treatment plan which can greatly reduce the symptoms and give a quality of life. Diagnosis of asthma is based on different type of things like medical history, physical exam, and results of certain tests. Pulmonologists and allergist will check your nose, throat, and upper airways and listen to your breathing and consult your medical history. 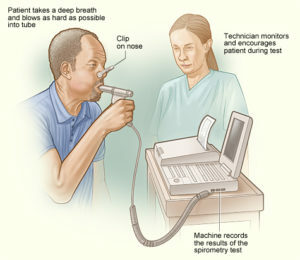 Some tests for the diagnosis of asthma are Spirometry, chest x-rays, etc. Rescue/Reliever Medicines provide quick relief of sudden symptoms. These medications start to alleviate the symptoms of asthma within a few minutes by relaxing the muscle spasms within the airways. The most commonly prescribed medication for the relief of asthma symptoms is albuterol, or a related medication called levalbuterol. The rescue medications can be administered via an inhaler or aerosolized with a nebulizer. Typically these medications can be given every 4 to 6 hours as needed. For children suffering from asthma, their rescue inhaler is often used with a device called a spacer. This device helps children inhale the medication into the lungs to alleviate symptoms of asthma. Your doctor may also prescribe a nebulizer for aerosolized delivery of the medication. Controller Medicines provide long-term control of asthma and prevent future symptoms. Your physician will determine if the frequency and severity of your or your child’s symptoms require the use of a maintenance medication. All of the controller medications work by reducing the inflammation in the airways. By reducing swelling, the lungs are stronger and a patient is much less likely to have asthma symptoms. The most commonly prescribed medication in maintenance control of asthma is an inhaled steroid. These can be given as an inhaler or via the nebulizer in small children. These medications treat the inflammation within the lungs, the primary problem in asthma. The inhalers for these medications differ between brands and your doctor will teach you how to properly administer to ensure that the medications reach the lungs. Corticosteroid medications have developed a scary reputation, but especially when inhaled, are extremely safe and effective for controlling asthma inflammation. It is very important that you or your child take all the medicines that the doctor prescribes. A common mistake is to stop taking controller asthma medications when the symptoms improve. Symptom improvement is due to the medication, it does not mean the asthma is gone! Leaving asthma untreated has much bigger risks than any risks associated with the medications. Asthma may improve or worsen with changes in season and exposure to asthma triggers, therefore it is important to have regular check-ups to evaluate and monitor your asthma as medication changes are necessary from time to time.